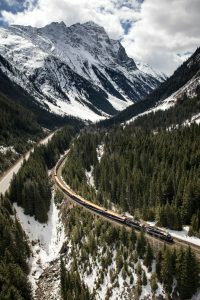 This spectacular and perfectly balanced vacation includes 4 days on the Rocky Mountaineer, from Vancouver to Banff and from Jasper to Whistler as well as a scenic 3 hour train trip from Whistler to Vancouver. Along with your 4.5 days on the train, you’ll spend 7 days exploring the Canadian Rockies, touring the Columbia Icefield, Yoho Park and Banff by motor coach and strolling along the shore of Lake Louise. 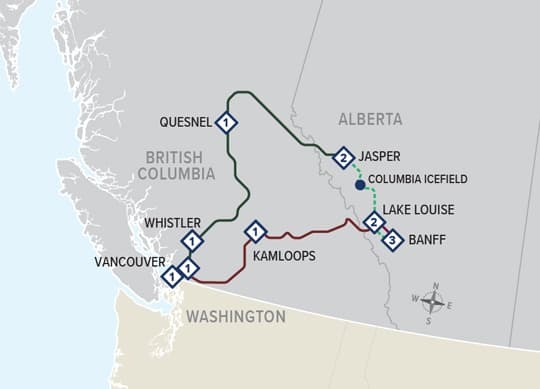 Includes overnight stays in Vancouver, Whistler, Quesnel, Jasper, Lake Louise Banff and Kamloops. Call 1-800-913-9207 or 604-990-9299 or Email for prices and more information. It’s possible to enjoy SilverLeaf hotels and upgrade to GoldLeaf Service on the train only. Call for prices.